There are not many things in this world more natural than seeing your dog run. If you’re a marathoner looking to finish an IRONMAN or just a casual runner looking to stay fit, your dog might be the key to keeping you motivated and on a consistent routine. Just like people, pets need exercise to live a happy and healthy life. Without it, there can be serious health consequences. According to the Association for Pet Obesity Prevention, a staggering 53% of dogs suffer from obesity. Obesity takes a major toll on their quality of life, and in most cases it is entirely preventable! If it just occurred to you that one of your best training partners has been laying on the couch while you’ve been out running, here are some tips to ensure your four-legged training partner will be pushing you to new levels each day! IS YOUR DOG READY TO RUN? To begin, set up an appointment with your veterinarian. Vets will be able to inform you of any preexisting conditions your pet may have as well as recommend warm-ups, cool-downs, and stretches best suited for your canine. Your vet can also provide advice on whether supplements like glucosamine and chondroitin will be a good fit for your pet. 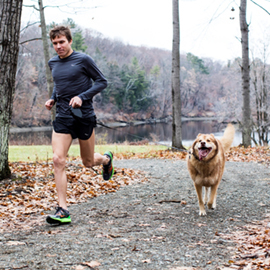 Vets will also help tell you if your pet is at an age to where it can begin a consistent running routine. Running with your puppy too early could risk permanent damage to your pet’s joints and bone structure. Remember, a 6-month-old puppy is equivalent to 5 to 7 years old in human years. How early did you begin to run? As a rule of thumb, a dog’s growth plates should be closed before beginning an exercise routine. Large breed dogs take longer to fully develop compared to small breeds, leaving them more susceptible to joint damage from too much activity. Dogs have to adapt to fitness just like humans. You’re not going to go on a 7-mile run when you haven’t run a mile in the last year, would you? (Yes, we all have that friend who signs up for a marathon and starts “training” a week before the race.) Start your dog off with short 5 to 15 minute jogs. This will not only help them get used to running on-leash, but will help to build up their stamina for longer runs. When you feel that your dog is able to maintain the same pace the entire run, you can add on 5 to 10 more minutes. Be conscious of where and when you’re running. Pavement is hard on joints, for both humans and dogs. Pavement also heats up in the sun and can burn your pet’s paws if it’s too hot. Dirt and grass trails in well-shaded areas are softer and cooler. If that’s not something that’s readily available for everyday runs, make an occasional special trip to a nice trail to give both bodies some recovery. Depending on where you live and the time of year, climate affects your run. If you hadn’t noticed, dogs wear a fur coat all year long. Although they have sweat glands in their paws, they do not have them on the rest of their body and rely mostly on the evaporation effect of panting to cool down their bodies. 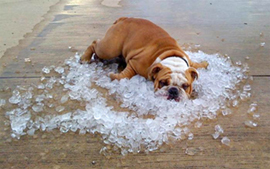 Offering small amounts of cool (not iced) water every 15 – 20 minutes will help to prevent dehydration and keeps your dog from gulping large amounts of water, which can lead to bloat in some breeds. If you notice one or more of these symptoms, it’s time to stop and recover. Like any athlete, nutrition is performance. Dogschart9 rely on high-quality animal-based protein sources like salmon, turkey, duck, and lamb to provide the amino acids they need for muscle recovery, and an optimal balance of healthy fats and low-glycemic carbs for the energy to perform at their best. Taking the time to choose the best food to fuel their inner athlete is the best way to set your new training partner up for success. So next time you reach for your running shoes, remember to dust off that leash and help your loyal four-legged companion to live healthier together with you. Walking is one of the best ways to exercise dogs of all ages. Learn how this simple activity benefited both of Ironman champion Kelly Williamson’s pups. Does This Collar Make Me Look Fat? Over half of American pets have parents with “feeding disorders.” We’ve become a nation that’s feeding the human equivalent of fast food to our dogs, and supersizing them at the same time. Too often we see news footage of pet owners desperately deciding what to do in an emergency. Whether it’s a natural disaster or a sudden crisis, it’s important to have a plan. 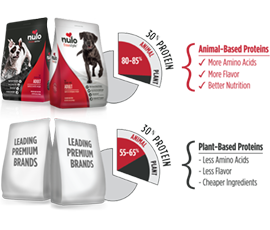 Find Nulo at a store near you. On the hunt for nutritious pet food? Chances are, there's an awesome store that sells Nulo in your neighborhood. © Copyright 2018 Nulo. All rights reserved.